The Democratic Congressional Campaign Committee raised the alarm in an email sent to supporters Saturday, calling for a "MASSIVE uprising." 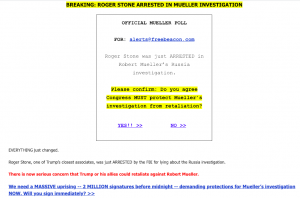 The email detailed Roger Stone’s arrest Friday, and the implications for the investigation into President Donald Trump’s 2016 campaign. It warned that "[t]here is now serious concern that Trump or his allies could retaliate against [Special Counsel] Robert Mueller." In response, the email demanded "a MASSIVE uprising" to save the investigation. It called for supporters to sign their names, claiming to need "2 MILLION signatures before midnight" in order to protect Mueller’s investigation. Part of a DCCC call for a "MASSIVE uprising." It was not immediately clear why the signatures would protect Mueller. As of Sunday morning, the DCCC’s petition page claimed to have received over 1,556,000 signatures. 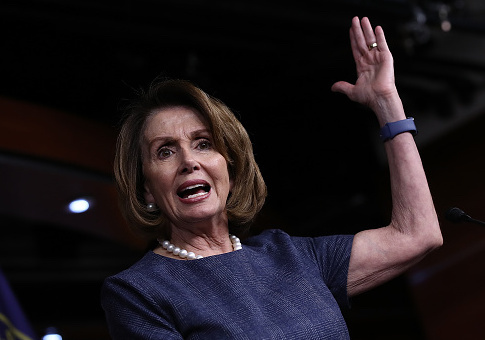 The DCCC has made claims contradicted by facts in the past. In the 2018 cycle, the DCCC ran ads falsely claiming a Republican candidate had enriched himself. His net worth had actually fallen. The DCCC is also a bogeyman of sorts for progressives worried about corporate interests and centrism in the Democratic party. In the last election cycle, it released opposition research against one Democratic candidate in an effort to boost another. The DCCC has received ethics complaints for failing to disclose in-kind contributions. The revolutionary language echoes that used by Rep. John Garamendi (D., Calif.) during Justice Brett Kavanaugh’s confirmation hearings. Garamendi called for members of Congress to "rise up in disgust and anger" if the then-nominee’s accuser did not get the chance to testify before the Senate Judiciary Committee. This entry was posted in Uncategorized and tagged DCCC, Donald Trump, Robert Mueller. Bookmark the permalink.